Last week's GAMA Trade Show has wrapped up, and the crew is all home. Overall it wasn't a bad show. The number of attendees was lower than last year, which was lower than the year before. The official reports have the drop at a mere 20%, but we gave away about half the retailer packets we did in 2008. But we did keep busy. 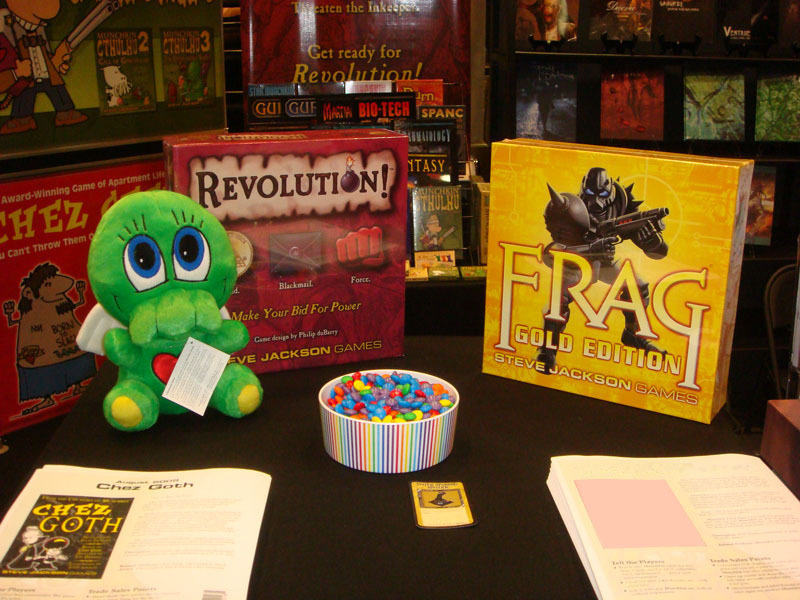 Fewer retailers meant we had more time to actually chat with each one, answering questions on our favorite topic: our games. 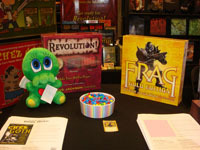 Munchkin and Munchkin Quest received much love, Frag Gold Edition attempted to break wrists, and the Revolution! demos turned more than one "hmmm" into a "WOW!" Oh, and the Munchkin mascot was running around. I took a ton of pictures -- and a couple videos -- so we'll have Flickr fodder just as soon as I can sort out the incriminating photos from the promotional ones. The show wouldn't have run nearly as smoothly for us without Will and Randy acting as the fantastic demo monkeys they are, or Phil and Andrew playing the roles of mascot and handler. Thanks guys! You guys made this booth boss' job much easier! We're always happy to have the chance to get face time with the retailers out there on the front lines, selling and playing the games we make. And we remind all those who didn't get to make it to Vegas this year that a) we have all the promotional information we were handing out available on the Retailer Packet page, and b) we also attend the various distributor open houses coming this fall!